This installation, commissioned for a group exhibition entitled "New Directions," was derived from a work of conceptual art executed in the late 1960s by the artist Michael Asher. The Asher work was itself a response to a request for participation in a group exhibition, for which he had a piece of glass cut to the median measurements of all the works of art by the other contributors. 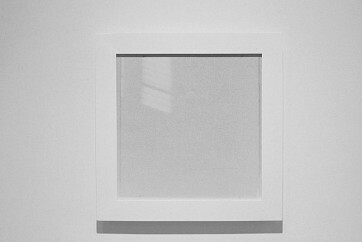 Asher then had this piece of glass installed on the gallery wall with small finishing nails. For this project, Asher's project was photographically reproduced from the titular monograph of his work, framed, and hung in the "New Directions" group show. 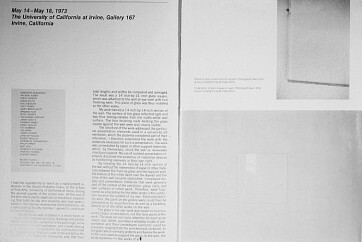 In addition, a catalogue/brochure was made available in the gallery, signaled by the inclusion of a line of type - CATALOGUE AVAILABLE - on the wall next to the framed photograph. 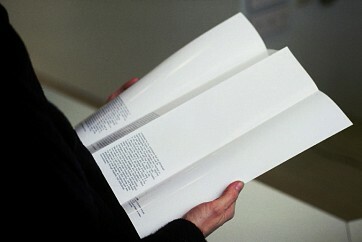 The catalogue/brochure for this project includes texts reproduced from the Asher book, texts from the official catalogue accompanying the 1990 exhibition, and additional texts comprising a discussion of the genre of group exhibitions, the philosophical and political purport of individual and group, and a history of the project itself. When opened to its full size the catalogue/brochure has the same dimensions as Asher's piece of glass. *This project also exists as a powerpoint presentation tracing the development and eventual sale and resale of the project.